Russia’s Euro 2016 qualifying match against Montenegro was abandoned after two Russian players were hit by objects thrown from the crowd. 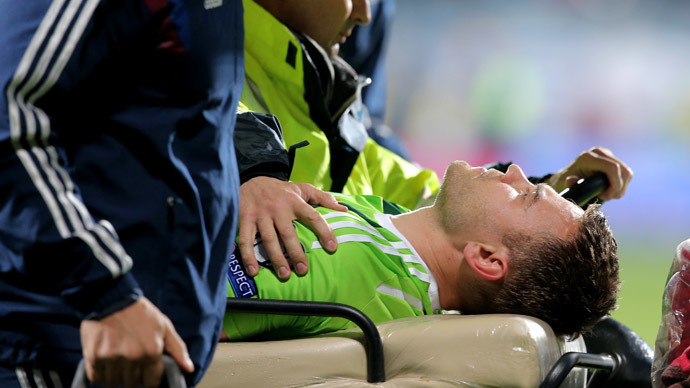 Goalkeeper Igor Akinfeev was hit by a flare, while Dmitry Kombarov was struck by a cigarette lighter. What should have been a crucial European qualifier for both sides in Podgorica got off to the worst possible start. The match had just kicked off, but with a minute gone, Russia goalkeeper Akinfeev was struck by a flare thrown from the second tier of the stand behind the goal, where the Montenegro fans were sitting. The 28 year-old immediately fell to the ground and was carried off on a stretcher, before being taken to hospital. The Montenegran fan who threw the flare was identified by CCTV and detained, according to a stadium employee. Eduard Bezuglov, the doctor attending the Russian team, said the goalkeeper suffered a concussion and burn to his neck. German referee Deniz Aytekin immediately stopped the match and ordered both teams to leave the pitch and go to their dressing rooms. A delay of around 35 minutes ensued, as the UEFA match delegate consulted with UEFA President Michel Platini on whether the match should continue, a source from the organization told Tass news agency. Russia coach Fabio Capello was against his team returning to the pitch. However, following a long delay both teams returned to the pitch and resumed play, with Zenit St. Petersburg’s Yury Lodygin replacing the unfortunate Akinfeev. An announcement from the director of the stadium warned supporters that any further trouble would lead to the game being abandoned. However, midway through the second half, trouble flared again. A Russian midfielder had just seen his penalty saved and as Dmitry Kombarov ran to take the resulting throw-in, he was hit by a cigarette lighter, according to teammate Vasily Berezutsky. "I think a lighter hit Dmitry Kombarov. Therefore the referee led the players off the pitch and to the dressing rooms,” Berezutsky told the Russia-2 television channel after the match. The match was subsequently abandoned by the UEFA delegate and Russia are likely to be awarded an automatic 3-0 victory, once European football’s governing body has carried out an investigation. The president of the Russian Football Union, Nikolay Tolstykh, said the game should have been halted following the Akinfeev incident. Если бы Капелло не вывел команду на поле, то грозило бы уже нам 0:3 и невыходом из группы. Но это был бы Поступок! Had Capello not taken his team back out onto the pitch, then Russia would have lost the game 3-0 automatically and would not have been able to qualify from their group. UEFA said it would wait to receive reports from the match delegate and referee before opening disciplinary proceedings but Russian coach Fabio Capello also said the match should have been stopped after the Akinfeev incident. "In my opinion, they needed to stop the game immediately," Capello told a press conference. "We did what the match delegate told us and went out on to the pitch and played. We could not simply refuse and walk away." Austria are currently top of Group G with 13 points from five games, while Russia are in third place with 5 points from four matches played. The top two teams at the end of the qualifying campaign will go forward to the Euro 2016 championships in France.